Prototype: Belgian State Railways (SNCB/NMBS) class 18 express locomotive. Four-system locomotive for the Benelux, France, and Germany. The locomotive looks as it did around 1980. Version in yellow/blue "Chiquita" paint scheme. 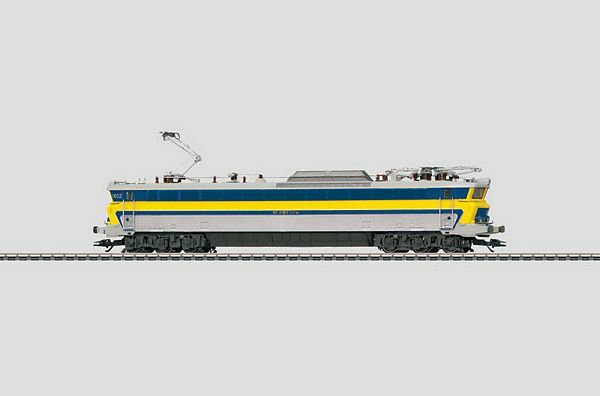 Model: The locomotive has an mfx digital decoder and a sound generator. It also has controlled Softdrive Sine high-efficiency propulsion and a compact design, maintenance-free motor, centrally mounted. 4 axles powered through cardan shafts. Traction tires. The headlights are maintenance-free, warm white LEDs; they will work in conventional operation and can be controlled digitally. The locomotive has separately applied metal grab irons. It also has separately applied steps. The locomotive has detailed roof equipment and different pantographs. The engineer's cabs have interior details including a figure of a locomotive engineer at the front. Accessory parts are included for installation on the buffer beams. Length over the buffers 25.3 cm / 9-15/16.